Also known as "Pretty Place," Symmes Chapel is located on the top of Standing Stone Mountain. It is part of YMCA Camp Greenville, a branch of the YMCA of Greenville near Caesars Head State Park. Fred Symmes gave the chapel to the YMCA so that its campers could enjoy its beautiful view all summer long. 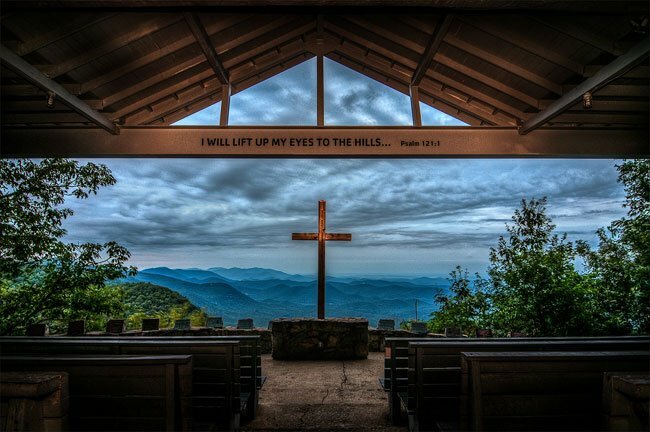 The open air chapel is inscribed with scripture and overlooks the Blue Ridge mountains. Constructed in 1941, it has seen several renovations, including a major one in 2012. Camp Greenville spans 1,400 acres and serves as a summer camp, conference center, and environmental education facility. The camp also features a small waterfall, swimming lake, and zip-line. Symmes Chapel is a popular wedding venue and worship site, and visitors are welcome during daylight hours as long as the chapel is not in use for other events. We strongly advise you to call ahead and check the schedule before planning a visit, especially if you are going on a Saturday or Sunday. Visit the Pretty Place webpage to find news and events going on at the chapel. Many thanks to photographer Charles Hardin of nearby Taylors for sharing this exquisite photo, taken in 2012. Want to see more? Click here to find other photos of Pretty Place in the South Carolina Picture Project. If you have a shot of Pretty Place that you'd like to add to our growing collection, please send it here. The 2013 South Carolina Cornbread Festival promises fun for the whole family! The event includes a "Live Sugar-Free" 5k run and walk, a cornbread cook-off, a children's cook-off, the "Little Miss Muffin" pageant, live music and more! You can find it at the corner of the 2800 Block of Main Street and Newman Street, in North Columbia. "Cocky" will be in attendance along with Benedict's Tiger and Clemson's Tiger! Want to see the full calendar? Click here to check out SCIWAY's complete calendar of March SC events. Also, remember that all of our event calendars, for every month of the year, are always available on SCIWAY's website – just go to https://www.sciway.net/calendar.html.